The DJI Mavic 2 updates contain fixes and improvements to your quadcopter. 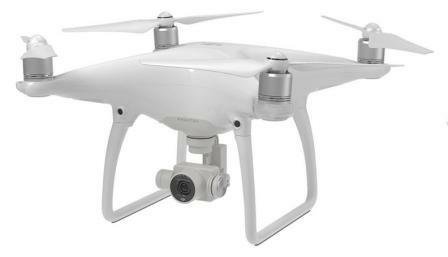 It is not just the Mavic 2 quadcopter and its components which the firmware upgrade fixes and improves. These DJI Mavic 2 firmware upgrades also contain software for the the remote controller and batteries. So it is very important to install the latest Mavic 2 firmware on your quadcopter. The instructions to updating the Mavic 2 firmware is the same for both the Mavic 2 Pro and Mavic 2 Zoom drones. However, there is a slight difference in the firmware update process between the Mavic 2 and the older original Mavic drone. So far, DJI have released 5 firmware updates for the Mavic 2 quadcopter. At the end of this post, you can read the firmware releases notes, including the issues fixed and improvements. It sure is very interesting to see what has been fixed and improved on. There are 2 ways to upgrade the Mavic 2 quadcopter and remote controller. You can update the Mavic 2 firmware using the DJI Go 4 app or the DJI Assistant 2 app using a computer. 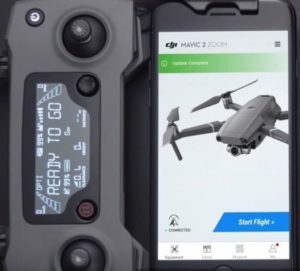 Below are the instructions including videos for updating the Mavic 2 Pro and Mavic 2 Zoom with the DJI Assistant 2 and DJI Go 4 apps. On a side note, if you are having issues where the Mavic disconnects from the Remote Control or DJI Go 4 app, then read our article on fixing Mavic Pro disconnects. While this is based on the older Mavic Pro, many of the troubleshooting tips can also be done on the Mavic 2 quadcopters. Updating the Mavic firmware is one of the steps in fixing any flying issues you may be experiencing. When using the DJI Assistant 2 software on a PC, it is not possible to update both the Mavic 2 quadcopter and remote controller as the same time. They are done separately. Visit the Mavic 2 download page and install the DJI Go 4 App on your smartphone or the DJI Assistant 2 App on your PC, depending on which method of update you choose. Make sure your Mavic 2, remote controller, smartphone or PC have at least 50% charge in them. Ensure that you have a strong internet signal when downloading the Mavic 2 firmware. It is a good idea to remove the propellers from the Mavic 2 quadcopter while doing the update. The process of upgrading the Mavic 2 firmware will restart the quadcopter a few times during the update. Never disconnect the Mavic 2 quadcopter or remote controller from the computer or smartphone during the firmware upgrade. If this happens, then the Mavic firmware update will fail. It could even corrupt the existing firmware. Then your Mavic 2 will not fly until the correct firmware has been installed. Switch the Mavic 2 quadcopter off. Connect the Mavic 2 quadcopter to a computer using the USB type A to type C cable. Power on the Mavic 2 quadcopter. Open the DJI Assistant 2 application and login to your DJI account. Select “Mavic 2” and click on the “Firmware Updates” on the left panel. Select the firmware version that you wish to update to and click on “Upgrade”. Wait for the firmware to be downloaded and the firmware update process will start automatically. Restart the Mavic 2 quadcopter after the firmware update is complete. If you have more than 1 battery, then you need to follow the above procedure to update each Mavic 2 battery. NOTE: The Mavic 2 firmware update may reset some main controller settings, such as the Return To Home Altitude and Maximum Flight Distance, to factory defaults. Before the update, take note of your preferred DJI GO 4 settings, and re-adjust them after the update to suit your preference. Switch the Mavic 2 remote controller off. Connect the Mavic 2 remote controller to a computer using a micro USB cable. Power on the Mavic 2 remote controller. Select “Mavic 2 RC” and click on the “Firmware Updates” on the left panel. Select the firmware version that you wish to update and click on “Upgrade”. The downloaded and firmware update process will start automatically. When the upgrade process has finished, a green “Update Complete” message will be shown. Reboot the Mavic 2 quadcopter after the firmware update is complete. The DJI Assistant 2 software has many more features than updating the Mavic firmware. The DJI Assistant 2 Mavic software can be used to upload data, analyze black box logs, calibrate sensors, modify the Mavic and simulate flight. You can read more on the Mavic Pro Assistant 2 software here. At the time of writing the Mavic 2 quadcopter and remote controller must be updated separately when using the DJI Assistant software. This video shows you quickly how to upgrade the Mavic 2 quadcopter and remote controller to the latest firmware release using the DJI Assistant 2 app. Connect your smartphone to the internet. Switch off the Mavic 2 quadcopter and remote controller. Connect your smartphone into the Mavic 2 remote controller. Power on the Mavic 2 remote controller and then the quadcopter. Launch the DJI Go 4 app on your smartphone or tablet device. If an update is available, you will see “New Firmware Update Is Available”. Click on the “New Firmware Update Is Available”. Click on the “Download Now” button. The Mavic 2 firmware file will download and the upgrade will start automatically. Note: The firmware update may reset various main controller settings, such as the Return To Home Altitude and Maximum Flight Distance, to factory defaults. Before the update, take note of your preferred settings in the DJI GO 4 app, and readjust them after the update to suit your preference. NOTE: View this large selection of Mavic 2 parts and accessories. This includes all the parts such as chargers, spare batteries so you can spend more time flying, propellers, cables, lens filters, DJI goggles and much more. Here is an excellent video which shows you how easy it is to update the Mavic 2 Pro and Zoom firmware using the DJI Go 4 app. Below are the Mavic 2 firmware versions released to date. 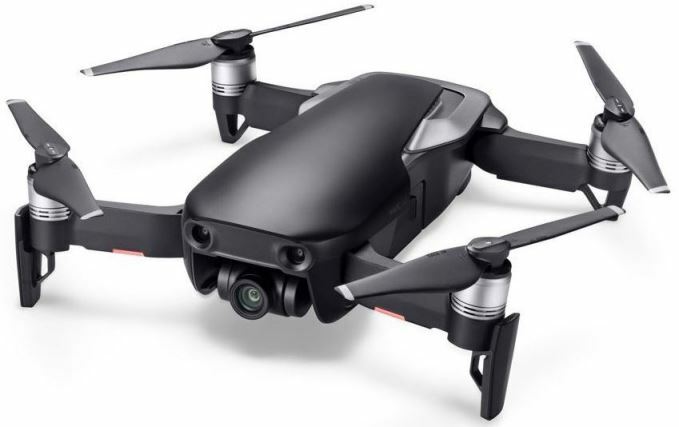 It is very interesting to read about the new features, which have been added and also various issues, which were also fixed by updating the Mavic firmware software. Increased the shutter speed to up to two seconds for Hyperlapse Circle and Course Lock (requires DJI GO 4 v4.3.4 or later). Added Task Library to Hyperlapse Waypoint (requires DJI GO 4 v4.3.4 or later). Enabled Lateral Vision Systems for Point of Interest 2.0 (see Mavic 2 Pro/Zoom User Manual for more details about obstacle sensing requirements). Added voice alert for ActiveTrack 2.0 when the subject is lost (requires DJI GO 4 v4.3.4 or later for iOS. Android version is coming soon). Added on-screen display when shooting in Hyperlapse and Panorama (requires DJI GO 4 v4.3.4 or later). Optimized the Vision Systems status display in DJI GO 4 (requires DJI GO 4 v4.3.4 or later). Added ability to make a selection and adjust the flight speed and duration for Hyperlapse (requires DJI GO 4 v4.3.2 or higher). Added ability to delete Hyperlapse and Panorama RAW footage in Playback (requires DJI GO 4 v4.3.2 or higher). Added ability to enable and disable Vision Systems by using remote controller’s C1 and C2 buttons (requires DJI GO 4 v4.3.2 or higher). Enabled Lateral Vision Systems for QuickShots sub-modes of Circle, Helix, and Boomerang. Refer to the Mavic 2 Pro/Zoom User Manual for more details about the requirements for obstacle sensing. Improved photo quality for Panorama. Added Super Resolution sub-mode for Panorama (Mavic 2 Zoom only). Adjusted the low battery warning level to 25%. Fixed occasional issue in Panorama where the camera was unable to take a photo. Improved the overall photo quality in Panorama. Fixed the occasional issue where the gimbal would not re-center after exiting QuickShots. Fixed the AE flicker issue (Mavic 2 Pro only) and green point issue (Mavic 2 Zoom only). Improved the overall photo quality of both Mavic 2 Pro/Zoom. Fixed the occasional issue in QuickShots where the camera was unable to record a video. Improved the overall video quality in QuickShots. Added ability to make a selection to adjust the flight speed and duration for Hyperlapse (requires DJI GO 4 v4.3.2 or higher). Added ability to enable and disable Vision Systems using remote controller’s C1 and C2 buttons (requires DJI GO 4 v4.3.2 or higher). Enabled Lateral Vision Systems for QuickShots sub-modes of Circle, Helix, and Boomerang.